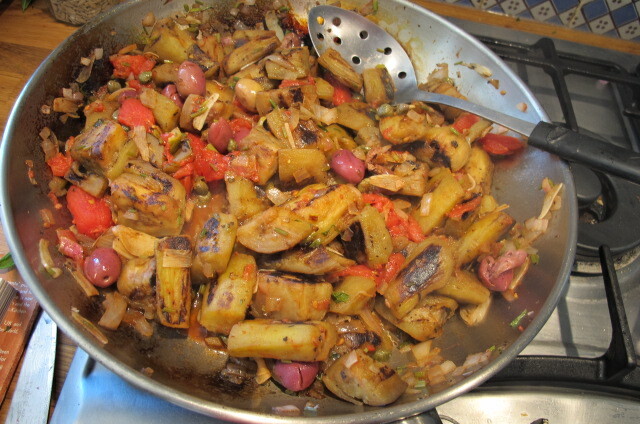 Caponata has as many versions as there are towns in Sicily, no doubt! Everyone has their way of cooking this traditional peasant dish. The English cook Jamie Oliver calls it Incredible Sicilian Aubergine Stew. It’s a good description; this is adapted from his version. This recipe is in my cookbook, Delicious Dishes for Diabetics, which is published in August in the UK, November in the USA. 2 large aubergines (aka eggplant)–cut in chunks, salted and left to drain–overnight if you can, but an hour or two anyway (They soak up less oil this way, when cooked.) Dry them thoroughly with kitchen paper. Heat 2 tablespoons of olive oil in a large pan. Cook on a highish heat to brown the chunks, turning them as they colour. When the aubergines are nicely coloured, add the onion, garlic and the parsley stalks. Add more olive oil if you feel it needs it. Add the olives, capers, and herb vinegar. When vinegar has evaporated, add the tomatoes. Bring up to a simmer and cook on a gentle heat for 15 to 20 mins, covered for the first 10 minutes, until the aubergines are really melting. Season with pepper and salt–bearing in mind that you salted the aubergines earlier. Serve with extra olive oil on hand. Tonight we have a vegetarian among the six, so I am serving this as a vegetable with our slow roast shoulder of lamb and as the main dish for the vegetarian. caponata–tastes better than it looks! It’s nice to have more ways with the blessed aubs! Wow, that looks amazing and I’ve never had this dish. Must remedy that. Unfortunately some of us diabetics have complications, and I am one of those. The nightshade vegetables (potatoes, tomatoes, eggplant, and peppers) really inflame my GI and immune systems. My blood glucose increases, my arthritis and fibromyalgia pain flares, I get headaches, and cannot sleep. You might want to check out my blog, antiinflammatoryfoods.blogspot.com as I’ve tried to add fresh fruits and vegetables into my diet, somewhat unsuccessfully. But I’m still trying! I will check it out, Anna–thank you. vegetable/fruit never quite sure how to tackle it, but this dish sounds so tasty,I am going to take my courage in both hands and give it a go. I adore this sort of food – hot or cold. When I was in Portugal a couple of years ago we were taken to a shop where the owner made items out of brass- one of them was a ‘Caponata’ cooker. It is like two colanders, but without the holes, and joined together on one side. You add all of the items into it after the initial preparation and then put it into a barbeque type fire to cook. The guide who took us there gave me a recipe which is very much like Robin’s. I bought the pan as it looked so nice but haven’t used it yet for some reason. I now have the urge to make it this weekend when our family come for a visit from where we lived until last autumn, Newbury in Berkshire to where we have moved to in North Devon – either in the Caponata cooker or on the stove – looking at the weather at present it will be on the stove! Thanks Robin for the inspiration. I am reading your updated Poldark book Robin (I still have the first version), and am enjoying it immensely. You should do more writting! How interesting–I will see if I can find a caponata cooker–(sounds nice anyway! )–online, thanks Thelma.